This is for you sceptics who thought I might be exaggerating about the local wildlife. We are not in the open desert here. We are not in a National Park. We are in the front entryway to my house, inches from my front door. And this -- for those of you who are lucky enough never to have got up close and personal with a wild boar -- is a javelina. A wild boar. Knocking at the front door, so to speak. Javelina are herbivores, but they've got sharp hooves, razor-like tusks (to defend themselves from the coyotes) and mean dispositions. They hate dogs, and have killed a number of little (and not so little dogs) in various parts of Tucson. They'll attack, unprovoked. And there were three of them. (You can only see two in the photo. But trust me. There were three) Three very big javelina. A minute earlier, Bao and I had come back from our morning walk. I'd brought the bird feeder indoors and filled it, and was just about to take it outside when I realized we had company. I just stood and stared. Then I realized that this one could see Bao quite clearly through the floor to ceiling glass window. And it was nearly as big as a jet ski. What if it decided to come through the glass? Grabbing Bao, I ran into the bedroom and slammed the door. Then I thought, Nobody is going to believe this. So I sneaked back out with the camera and took this picture. I'm thinking they were attracted by the running water in the fountain beside the front door. I've often wondered why that fountain needs to be refilled so often. Another mystery solved. They also breakfasted on the asparagus fern. 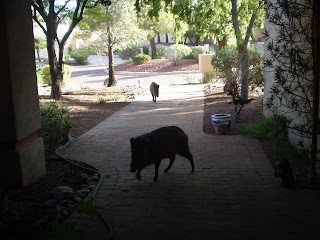 I've never seen javelina around here before, not even down in the wash. Its not like birds hovering around the feeders. Javelina are not fun. They're not cute. They're big, and they're scary. And they kill dogs for fun. From now on, we're going to have to watch ourselves when we walk. That's scary! Will you carry pepper spray with you on your walks? Would that deter them? I wouldn't like them, at all. And, I think I'd turn off the fountain, or find a place where they couldn't get to it. Yikes! The local wildlife must figure Bao looks like good eats!